The writing is on the wall for the poor old UMD. First Patapon 2 goes download-only, then Fate/Unlimited Codes, then we hear another rumour of a UMD-less PlayStation Portable. But it's not dead yet! That should answer any questions you have as to why they're sticking with it. There are millions of people who own Monster Hunter on UMD. 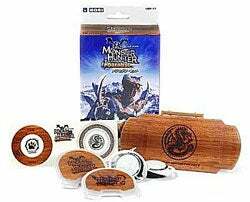 Meaning there are millions of people who own PSPs that play Monster Hunter UMDs. If there's only one game left being produced on UMD in the dark, distant future, it will be Monster Hunter.